By 1898, the schism at St. Adalbert’s between the diocesan priest and a group of upset parishioners saw the emergence of a breakaway Polish National Catholic Church. To curb the influence of the Polish Nationals, Bishop James Quigley asked the Very Reverend Hyacinth Fudzinski of the Franciscan Fathers in Syracuse to establish a parish within the East Side. On April 22, 1898, the parish of Corpus Christi was formally established and 29 lots on the corner of Clark and Kent Streets were purchased. A small wooden building on one of these lots was converted into a church that the bishop dedicated on May 27, 1898. The first structure on the site was a combination church and school building with the teaching Franciscan Sisters of St. Joseph running the classrooms. The parish rectory was completed two years later in 1900 and would become the headquarters of the Polish Province of the Franciscan Fathers Minor Conventual. Shortly thereafter, a new convent was built for Mother Colette Hilbert, the namesake of Hilbert College, and her sisters. 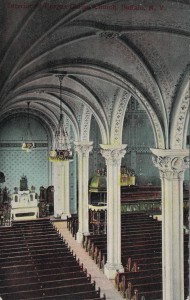 By 1907, the parish outgrew the combination building and the architectural firm of Schmill and Gould was hired to design a church worthy of the parish. They came up with a Romanesque church, made of medina sandstone, with two signature towers and space for some of the largest stained glass in the city of Buffalo. On June 13, 1909, Bishop Charles Colton blessed the completed edifice while Bishop Paul Rhode, the first Polish American bishop, was given the honor of celebrating the first Mass. Following the retirement of Father Fudzinski, Father Michael Cieslik took over Corpus Christi and soon started a campaign to decorate the interior of the church. Stained glass was ordered from Mayer of Munich in Germany and Marion Rzeznik was hired to paint a rendition of Raphael’s Disputa that included Franciscans. At the same time the Stations of the Cross were reframed. It would also under the pastorship of Father Cieslik that Father Justin Figas would begin his nationally syndicated radio show, the Father Justin Rosary Hour in 1931. Broadcasted from the sanctuary of Corpus Christi, the show would be heard weekly by tens of thousands of Polish Americans across the country. At the same time, Father Cieslik oversaw the construction of the Corpus Christi Athletic Club on Sears Street and the Girls Club on Clark. The Franciscans oversaw the parish for the next 77 years. Marion Rzeznik was brought back to add a mural of Christ and the Children and the portraits of the saints in the clerestory and Buffalo musician John Rzeznik attended the parish school, where his mother taught. As the Polish population migrated out of Buffalo, the parish began to suffer from the decline. Because of this, the Franciscan Fathers decided in 2003 that they would leave Corpus Christi and the church would be closed by the end of the year. Through the intervention of Monsignor Matthew Kopacz and some very dedicated parishioners, the Pauline Fathers and Brothers from the National Shrine of Our Lady of Czestochowa assumed control of the church in late 2003. Under their guidance the parish was revitalized and became a focal point of the Polish community. The Pauline Fathers also worked diligently to have the parish placed on the U.S. National Register of Historic Places, which it was in 2007. Album Jubileuszowy: Prowincji Polskiej O.O. Franciszkanow W Ameryce 1905-1930. Buffalo, NY: Drukkiem "Dzlennika Dla Wszystkich", 1930. Print. Clinton, Mrs. George. Interesting Points on the Architecture of Buffalo Churches. Buffalo, NY: Buffalo and Erie County Public Library. Print. Album Pamiatkowe I Przewodnik Handlowy: Osady Polskiej W Miescie Buffalo, Z Dolaczeniem Okolicznych Miejscowosci Ze Stanu New York. Buffalo, 1906. 458-461 Print. Corpus Christi Church Harvest Festival Dozynki 30th 100th Anniversary of Church Dedication 1909-2009. Buffalo, NY: Corpus Christi Church, 2009. Print. Drabik, Mike. "Ojciec Jacek (Hyacinth) Fudzinski, OFM (1855-1925)." A Selected Directory of Early Polish Priests. Polish Genealogical Society of New York State. Web. 07 Mar. 2011. Ederer, Martin. Buffalo's Catholic Churches: Ethnic Communities and the Architectural Legacy. Buffalo, NY: Digital@batesjackson, 2003. Print. Fortieth Anniversary of the Ordination to the Holy Priesthood of Very Reverend Eustace Bartoszewicz, O.F.M. Conv., Pastor of Corpus Christi Church, Buffalo, N.Y. Buffalo, NY, 1947. Print. "A New Church." The Buffalo Commercial [Buffalo NY] 13 Nov. 1901. Print. "Parishioners of Corpus Christi Will Move into New Home." The Buffalo Express [Buffalo, NY] 1 Apr. 1909, morning ed. Print. Polish Churches in Buffalo & Niagara Falls. Permanent Chair of Polish Culture at Canisius College, 1998. Videocassette.